Graduate Program of Herbal Medicine, Faculty of Pharmacy, Universitas Indonesia, Depok 16424 West Java 16424 INDONESIA. Rice bran oil has many helath benefit. The biologically active compounds of rice bran oil are fatty acids, squalene, tocopherols, phytosterols, tocotrienols, oryzanol, and polyphenols. Gamma oryzanol is a combination of at least 10 components of ferulic acid esters and alcohols triterpene. Gamma oryzanol has pharmacological activity includes cardiovascular disease, antioxidant, anticancer, antidiabetic, antiulcerogenic, neuroprotective and action immunomodulator. Ionic liquids are an environmentally friendly solvent used in the extraction and separation of bioactive compounds from plants. This study was conducted to evaluate the effect of inorganic salts addition on ionic liquid [Bmim]PF6 in increasing levels of gamma oryzanol from rice bran. In the experiments, IL [Bmim]PF6 - MAE method was used to separated gamma oryzanol compound, and then was partitioned with hexane after the addition of inorganic salts: KH2PO4, NaCl, NaNO3 and Na2CO3, respectively. Gamma oryzanol content was determined by HPLC analysis. A mixture of mobile phase (methanol:acetonitrile:isopropanol (5:4:1) and isocratic conditions at a wavelength of 327 nm. The flow rate is set at 1 ml / min. The highest levels of γ-oryzanol was produced from the addition in KH2PO4 + : [Bmim] PF6 by 0.26 ± 0.001 mg/g. The mechanism of salting-out effect of the compound due to the interaction of different types of interactions between solutes (ions of inorganic salts and ionic liquid) and solvent. The addition of inorganic salt increased the gamma oryzanol level. The addition of KH2PO4 on IL-MAE gave the highest level of gamma oryzanol. Gamma oryzanol is a chemical compound that is mostly composed of the complex ester trans-ferulate (trans-hydroxy cinnamic acid) with phytosterols (sterols and alcohol triterpene), including cycloartenol, β-sitosterol, 24-methylene cycloartenol ferulate and predominant campesterol.7,8 Figure 1 shows the molecular structure of trans-ferulate of four phytosterols as the main content of gamma oryzanol. Butylmethylimidazolium hexafluorophosphate ([BMIM] PF6) was based on the solutes charged state or relative hydrophobicity. The length of IL alkyl chain indeed exerts a significant impact on the extraction yield of lipophilic compounds. Also the hydrophobic ion liquid phase exhibits a high affinity for ionic compounds when neutralized.10 The ionic liquid [Bmim] PF6 has [PF6-] hydrophobic anion as shown in Figure 2. MAE is an extraction method that utilizes microwave radiation to accelerate selective removal extraction by heating the solvent quickly and efficiently. Microwaves reduce enzymatic activity that damages the target compound.16 Some of the advantages of the method MAE include the extraction time is shorter, the use of the volume of solventless, easily adapted to conditions ranging from the size of the sample, temperature, pressure, amount of solvent, and the number of samples. Gamma oryzanol can be separated and quantified using high-performance liquid chromatography (HPLC). In this study will be conducted IL-MAE extraction method using a solvent ionic liquid [Bmim]PF6 by optimizing the addition of some inorganic salts to separate gamma oryzanol from IL so that levels of gamma oryzanol in rice bran extract can increase. Chemical structure of main components in γ-oryzanol. Chemical Structure of ILS BMIM [PF6]. Calibration curve of standard γ-oryzanol. Centrifuge (Heraeus-Christ GmbH, Osterode, Germany). Vortex (WiseMix VM-10, Daihan Scientific, Korea). Microwave (Modena MV-3002 with slight modification). HPLC system (Shimadzu, Japan). The column used is a type Zorbax Eclipse Plus C-18 Analytical 4.6 x 150 mm, 5μm (Agilent Technologies-USA). Fresh rice bran varieties IR (Oryza sativa L.) were obtained from the milling of rice Bogor West Jawa. Standard gamma oryzanol was purchased from Sigma-Aldrich Chemical Co. (St. Louis, MO, USA). [Bmim]PF6 1-(butyl-3-methylimidazolium hexafluorophosphate) (>99%) was purchased from Chengjie Chemical Co., Ltd., (Shanghai, China). Acetonitrile, isopropanol and methanol with HPLC grade were obtained from Merck. The fresh rice bran was stabilized by heating in an oven at 110° C for 15 minutes, then cooled in a container of ± 30 minutes to reach room temperature. The stabilized rice bran was put in clear plastic and store at room temperature. [Bmim]PF6 (1M) was dissolved by the addition of 11% isopropanol (v/v) and then was sonicated for 10 minutes until homogeneous. In this study the optimization of some inorganic salts solution such as KH2PO4,NaCl, NaNO3 and Na2CO3 at a concentration of 0.01 mol. Stabilized rice bran (1 g) was put in a flat-bottom flask, then added 10 mL of solvent ILs with the appropriate volume of experimental design 1:10 (b/v). After that the flask containing stabilized rice bran powder and IL concentration (1 M) was then put in the microwave that has modified with the same treatment includes variation extraction for 10 minutes and 30% microwave power. After the extraction process, the sample cooled at room temperature for 10 minutes. Then filtered using a filter paper to obtain a filtrate desired as a result of extraction MAE. Furthermore, the filtrate added N-hexane (1 ml) and 1 ml of inorganic salt. Then vortex for 10 seconds and was followed centrifuged at 3000 rpm for 15 minutes to separate the residue with the supernatant. The supernatant (0.5 ml) was diluted by isopropanol and was put in a flask up to 10.0 ml. Then the solution of the sample (20 ml) was injected into the HPLC system (Shimadzu, Japan). The HPLC was equipped by a column type Zorbax Eclipse Plus C-18 Analytical 4.6 x 150 mm, 5μm (Agilent Technologies-USA). Methanol:acetonitrile:isopropanol (5:4:1) was used as mobile phase under isocratic conditions, with flow rate 1 ml/min, and monitored by UV detector wavelength set at 327 nm. Each sample measured with three repetitions. 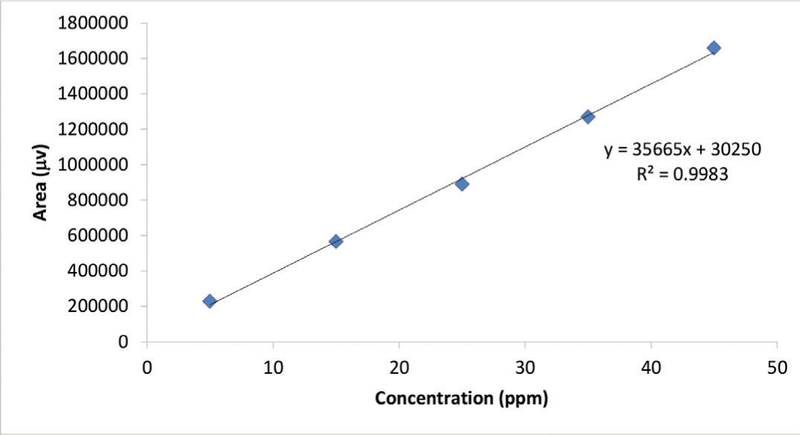 Further calibration standard curve in the range of concentration of 1 ppm-45 ppm at wavelength 327 nm as shown in Figure 3 below. 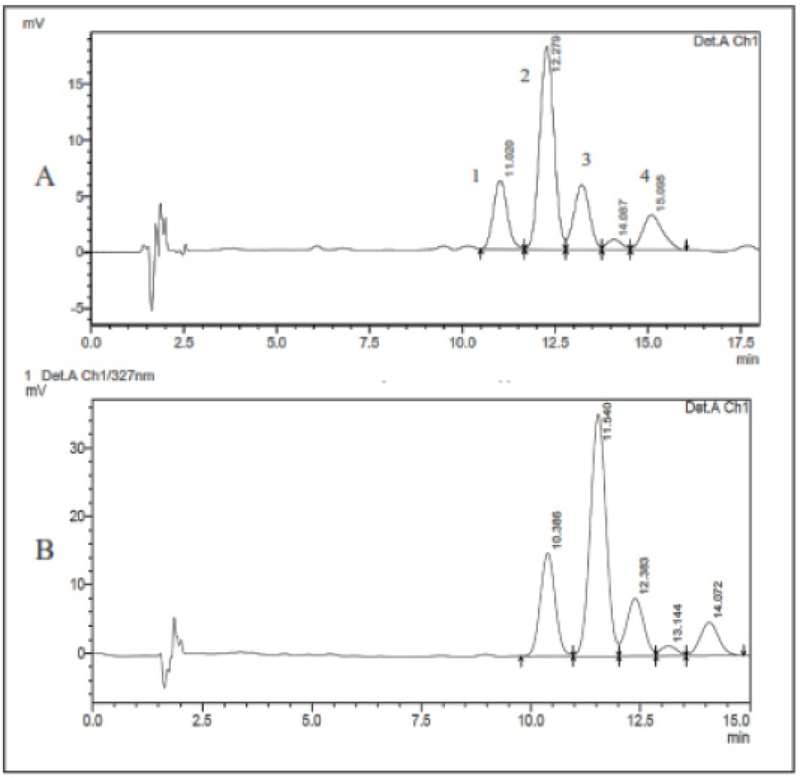 Figure 4 shows chromatogram of standard gamma oryzanol and sample after addition of KH2PO4 solution. Based on the chromatogram, four component of gamma oryzanol were detected, i.e: cycloartenol ferulate, 24-methylenecycloartenol ferulate, campesterol ferulate, and β-sitosteril ferulate. The sample preparation without the addition of salt showed levels of gamma oryzanol 0.026 ±0.001 mg/g. The addition of all used salts on the samples showed increasing of the gamma oryzanol level if was compared with that no salt addition. Figure 5 shows the effect of the addition of KH2PO4, NaNO3, NaCl, and Na2CO3, respectively on the increase of gamma oryzanol concentration. Based on the results, the order of strength of the salt solution on the increasing of gamma oryzanol level was as follow: KH2PO4> NaNO3> NaCl> Na2CO3. HPLC chromatograms of A: standard (45 ppm), B: Sample from ILs BMIM[PF6] extraction after addition KH2PO4. HPLC condition: UV detector xwavelength at 327 nm, the flow rate was set 1 ml/min. 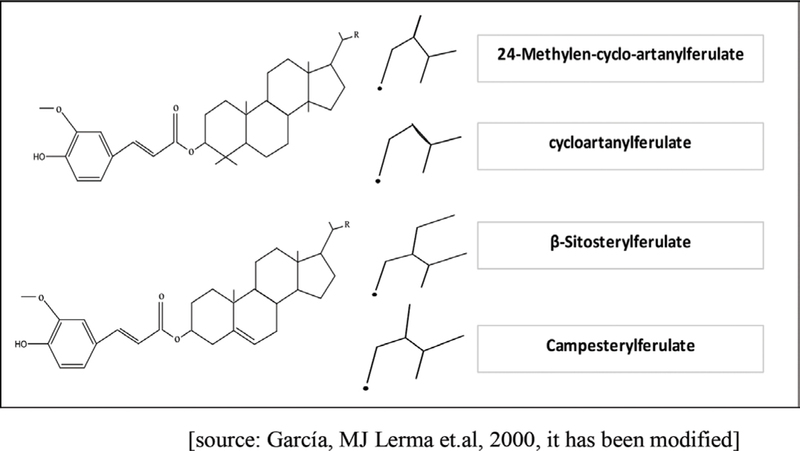 (1) cycloartenol ferulate, (2) 24-methylene cycloartenol ferulate, (3) campesterol ferulate, and (4) β-sitosteril ferulate. Effect of Addition of Inorganic Salts on Ionic Liquid. The methods of IL-MAE without the addition of salt obtainable levels of 0.026 mg/g while on the method IL-MAE by the addition of salts KH2PO4 provide levels of gamma oryzanol of 0.26 mg/g. 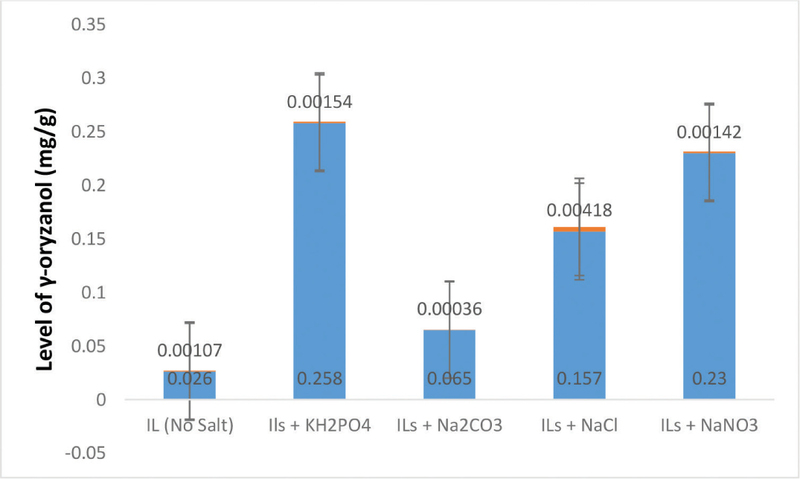 This shows that the addition of KH2PO4 salts increased levels of gamma oryzanol of 900%, which is caused by the interaction of solutes (ion of inorganic salts and ionic liquid) and solvents. In previous research that has been conducted by researchers with MAE method using isopropanol as conventional solvents and gamma oryzanol content of 0.25 mg /g. According to the Mandal et al 2007, this may be due to the high temperature and high power breakdown cell walls intensify.22 Each microwave power influenced by extraction time and extraction temperature. An interaction between the solvent isopropanol and the matrix material so that the rice bran can absorb microwaves. Rapid heating of the cell causes cell breakdown and spending target compounds into the polar solvent efficiently. Results of the previous study by Duvernay (2005) shows an increase in rice bran oil was obtained from the temperature of 80ºC to 120º C using microwave assisted extraction (MAE) with isopropanol as solvent extraction, where the high-temperature isopropanol as solvent proved to be significantly better than the rice bran oil by hexane extraction.23 The stability of the γ-oryzanol in isopropanol solution was high enough at room temperature.24 A solvent with medium or low volatility, such as isopropanol is more preferable, especially at room temperature. The mechanism of salting-out effect of the compound due to the interaction of different types of interactions between solutes and solvent. The addition of various inorganic salts on the IL as an alternative for the recovery of active compounds from plants. The highest levels of gamma oryzanol (0.26 ± 0.001 mg/g) was resulted from the addition of salt KH2PO4 + [Bmim] PF6. This research financially supported by the Directorate of Research and Community Engagement (DRPM), Universitas Indonesia through PITTA 2016. Conflicts of interest CONFLICT OF INTEREST The authors declare no conflict of interest.